Frontiers Music s.r.l. is well-known for its amazing n' melodic rock/hard rock releases. Over the years this label has released some excellent and classic records, no doubt 'bout that. Another strong point of this label is also the heavier stuff. Spirits Of Fire is Frontiers' newest project and the sure thing is that will bring a wide smile upon the face of every metal-head out there. Spirits Of Fire is metal's dream team! Yes, I'm not kiddin' here. The band's line-up consists of (hold your breath.....) Tim "Ripper" Owens(ex-Judas Priest, Iced Earth), Chris Caffery (Savatage,Trans-Siberian Orchestra), Steve Di Giorgio (Testament, Death, etc.) and Mark Zonder(ex-Fates Warning, Warlord). Really impressive line-up, don't you think? Of course these well-known musicians needed an excellent producer to produce their debut opus. LA-based producer Roy Z. (Bruce Dickinson, Halford,Tribe Of Gypsies) was the right man and SPIRITS OF FIRE is born!!!! The band's self-titled record is going to be released this February through Frontiers Music s.r.l. Guitarist Chris Caffery says a few words about his collaboration with Roy Z. and of course about the new album : "My influences for writing on this record were the bands that we were and are still in! I wanted to write songs that [Judas] Priest, Savatage, Testament, and Fates Warning fans would like. I grew up listening to Judas Priest and spent 30 plus years working with Jon Oliva and Paul O’Neill with Savatage and TSO. This was the first time that I ever worked with Roy and it was so much fun. I have been a huge fan of his work for a long time. He’s written music, played on, and produced some of my favorite metal albums ever." So as you can all assume by reading the line-up of Spirits Of Fire and Chris's words, the one thing that you can expect here is pure, old-fashioned and in-your-face METAL stuff!!! The 'screaming' guitars by Chris are just awesome! Man, this guy can, for damn sure, deliver some metallic and 'screaming' for more guitar solos n' riffs. I just love his playing. Tim 'Ripper' is well-known for his 'metal' vocals. His work with Priest and Iced Earth showing his skills and rightly consider of one of the best of his kind. The rhythm section of Di Giorgio and Zonder kick some serious asses too. Some of the highlights here are "Spirits Of Fire", "Light Speed Marching", the 'doom' and darker "A Game", the groovier metal hymn of "Meet Your End" (reminded of Metallica's earlier works.....) and the classic and very DIO-esque "Never To Return". Just check out also the epic and almost 7.30 minute long tune of "The Path"!!!! Pure metal paradise!! Of course that doesn't mean that the rest of the songs are fillers....no way! I think that I just gave you a lot of reasons to buy this metal gem! 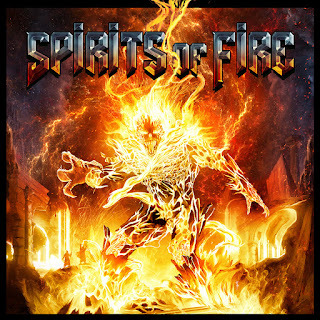 Spirits Of Fire is a classic metal record all the way. It really stands besides bands such as Savatage, DIO, Metallica, Judas Priest and Fates Warning!!! Killer metal songs, killer guitar lines, soaring n' metal vocals and a solid production.....do you need more?